COLUMBIA, Mo 7/19/13 (Feature)-- More police! More money! A special 'public safety tax!" Bigger Columbia police headquarters. 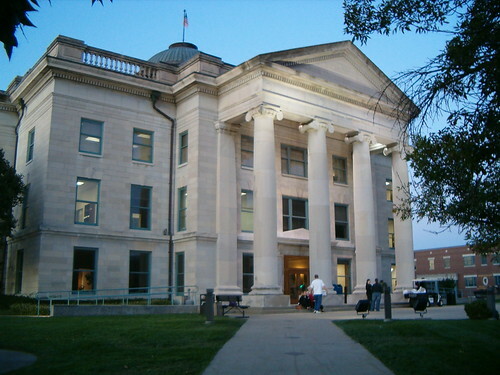 A much-enlarged Boone County Courthouse. In the war on crime, it seems more is better to leaders in Columbia and Boone County. More of everything, that is, than prison time for repeat offenders who cannot rehabilitate. The arrest last week of Columbia resident Dorothy Twala Mercine Kee for roughly her twenty-eighth offense in 23 years prompted the Heart Beat to republish and update this story from 2008, which also appeared in the Columbia Business Times. Kee's story illustrates revolving-door justice at its unfortunate worst. Now 43, Kee has spent nearly all her adult life in and out of Boone County's criminal justice system. She needs help -- needed it years ago. But for reasons that are probably a mix of addiction's powerful grip and government's inability to handle the compassionate side of justice, Kee has never received more than a program here, a suspended sentence there, some time in the Big House, and trip after return trip to a little house where a homeless existence awaits. Better courts -- or more cops? As any police officer will tell you, effective law enforcement resides not only with the cops, but with the courts. But for Dorothy Kee, the Boone County Courthouse is a revolving door circus of trial continuations, revoked probations, failures to appear, suspended sentences, and hundreds of thousands of tax dollars. “We found drugs in her house again,” a Columbia police officer told me, with frustrated resignation. Man, woman arrested as police seize crack blared a Columbia Daily Tribune headline. By this time, Kee was on at least her 24th criminal offense since 1990. After posting a $5,000 bail bond ("bonding out") she was released yet again to the ramshackle home she inherited from her parents. Surrounded by quiet, law-abiding neighbors, the 2-bedroom house sat vacant for over 5 years during her most recent prison stint. Frozen sewage burst through the cleanout pipe in the front yard; Ameren removed the gas meter; and a tree grew through a wall. It was the same tree Kee's deceased mother and father, Dorothy and Roy, worried would crack the foundation in 1995, when United Way Day of Caring volunteers cut it down for free. Dorothy Twala's mom, then 68, was in a wheelchair. Her father Roy, 63, was blind. Neighbors remember the Kees as lovely people. No one knows exactly what took their daughter so far off course. Casenet—an online summary of Missouri court activity—provides a window on Kee’s life as a de facto ward of the courts, mostly since her parents died. It's eye-opening and tragic. Represented by a public defender, Kee often doesn’t show for hearings, instead bouncing from continuance to continuance—a judicial term for changing a trial or hearing date. When she does appear -- in front of Boone County Judges Frank Conley, Larry Bryson, Gene Hamilton, Gary Oxenhandler, and Deborah Daniels over the years -- Kee hops from suspended sentence to suspended sentence, reprieve after reprieve. DEFENDANT FAILS TO APPEAR. DEFENDANT REQUESTS A CONTINUANCE FOR NEGOTIATION. WITHOUT OBJECTION CONTINUANCE IS GRANTED. HEARING ON MAY 21, 2009 IS CANCELLED. CASE IS CONTINUED TO JUNE 10, 2009. DEFENDANT REQUESTS A CONTINUANCE FOR NEGOTIATION. WITHOUT OBJECTION, CONTINUANCE GRANTED AND CASE IS RESET TO AUGUST 13, 2009. DEFENDANT REQUESTS A CONTINUANCE FOR NEGOTIATION. WITHOUT OBJECTION, CONTINUANCE IS GRANTED AND CASE IS RESET TO JULY 8, 2009. DEFENDANT REQUESTS A CONTINUANCE FOR NEGOTIATION. CONTINUANCE GRANTED AND CASE TO RESET AUGUST 27, 2009. DEFENDANT FAILS TO APPEAR, BOND FORFEITURE ORDERED WITH HEARING SET FOR 09-17-09. Though she's facing her umpteenth felony charge, Kee will undoubtedly be freed again to re-offend. Meanwhile, Columbia's leaders fuss and fret about rising crime, calling for more and bigger, or laws (like curfews) that restrict the liberties of the law-abiding. Instead, they need to realize "criminal justice" is an oxymoron at the revolving door of the Boone County Courthouse and probably many other courthouses besides. Dorothy Twala Kee has so much company at the revolving door, it's a wonder it revolves at all. But it does revolve, so fast that judges release repeat offenders almost as quickly as police catch them. EXECUTION OF SENTENCE SUSPENDED AND DEFENDANT PLACED ON UNSUPERVISED PROBATION FOR 2 YEARS. Outcome: PROBATION REVOKED AND SENTENCE OF 90 DAYS BOONE COUNTY JAIL ORDERED.